Ecological restoration of moths in the Cretaceous Burmese amber forest. Credit: YANG Dinghua. Butterflies have fascinated humankind for millennia and have been interpreted in a variety of ways, from omens of love to personifications of the soul. Part of their appeal lies in their wings’ iridescence, where the same principle behind soap bubbles applies — only at a whole new level. As small as they are, butterfly wings are covered by thousands of microscopic scales, split into two to three layers. Each scale is comprised of multiple layers separated by air. So, what happens is the many equally-spaced layers of the butterfly wing create multiple instances of constructive interference, rather just a single instance from the top to the bottom as is the case in a soap bubble. In some species, such as the morpho butterfly, the resulting effect can be astonishing. But, unlike pigments, which can survive for millions of years, structural colors are far more difficult to interpret from fossils. Luckily, Chinese researchers at the Nanjing Institute of Geology and Palaeontology, in collaboration with colleagues from Germany and the UK, were able to use novel methods to find that butterflies have been sporting this sort of flashy display for a long, long time. Wings and scales of Jurassic Lepidoptera and extant Micropterigidae. 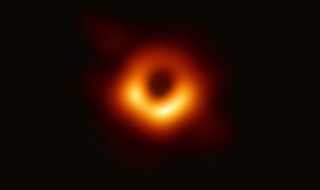 Credit: ZHANG Qingqing et al. The team used a combination of advanced imaging techniques on more than 500 ancient butterfly specimens to reveal the wings’ ultrastructures — the architecture of cells visible with magnification. Only six specimens were well preserved enough to be of use, including a 200-million-year-old insect. Most of the butterflies were fossilized in stone, which means their pigment color is gone, but their nanostructure lingered. By examining the fossilized under an electron microscope, the researchers were able to discern the wings’ pattern: an upper layer of large fused cover scales and a lower layer of small fused ground scales, plus preserved herringbone ornamentation on the cover scale surface. Optical modeling allowed the researchers to infer the structural patterns and characterize the wings’ optical properties. Tarachoptera from mid-Cretaceous Burmese amber. Credit: ZHANG Qingqing et al. 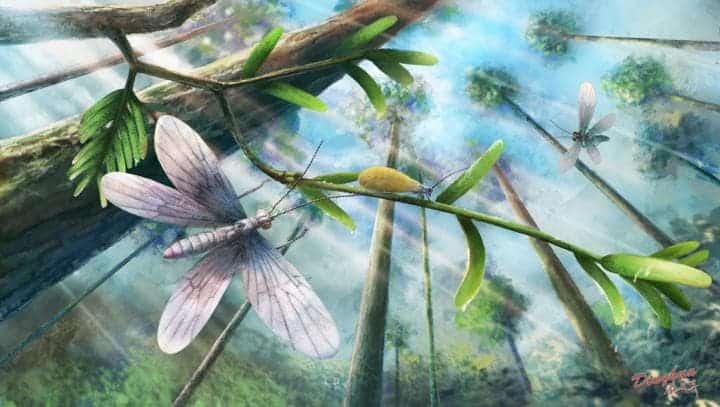 This analysis suggests that the ancient insect had a color pattern nearly identical to those found on several extant species from the Micropterigidae superfamily — the most primitive extant lineage of Lepidoptera, the insect order that includes butterflies and moths. 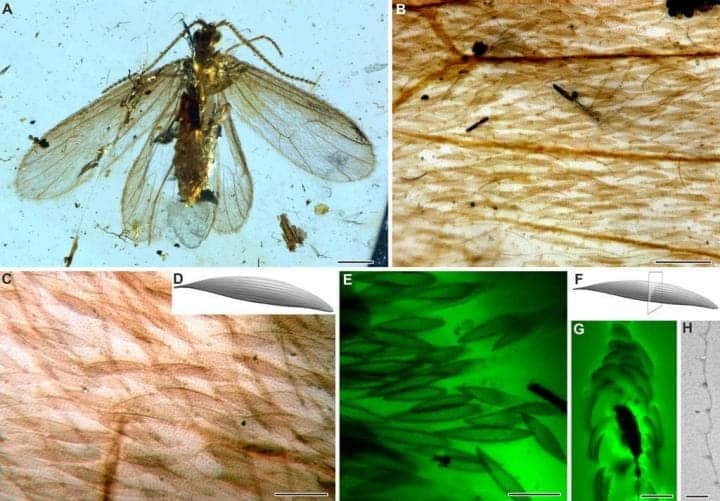 Optical modeling confirmed that diffraction-related scattering mechanisms of the fossil cover scales would have displayed broadband metallic hues as in numerous extant Micropterigidae, as reported in the journal Science Advances. 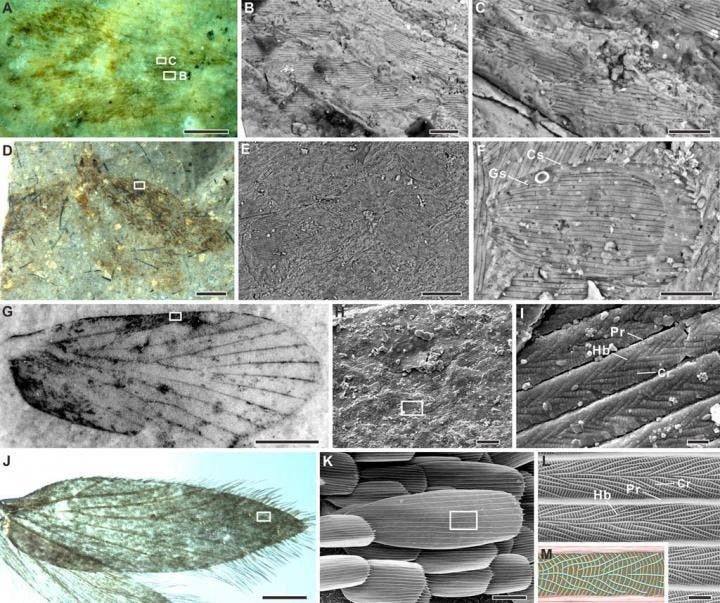 Judging from these findings, it seems like the iridescent pattern of wing scales have been an integral part of the Lepidoptera family at least since the Jurassic. Future studies will characterize the optical response of scale nanostructures in other fossil specimens in order to determine the models of the evolution of structural colors in Lepidopterans.